It’s Here! The Hot Wheels Pleybox! We are Pley affiliates and as such receive free PleyBoxes for Nat Geo Kids, Mystery Disney Princess and now the Hot Wheels PleyBox. Our opinions are out own. We’ve been looking forward to this Hot Wheels Pleybox for some time now. It is the newest box and it is so much fun. Inside there are some great Hot Wheels items. This first box came with 4 cars, a track builder playset, 3 feet of orange track, an exclusive tshirt and an activity book. The PleybBox itself can be used for some special stunts, too. Some of the cars inside are early access. I also loved the design of the tshirt. Andrew did, too because he wanted to put it on immediately. 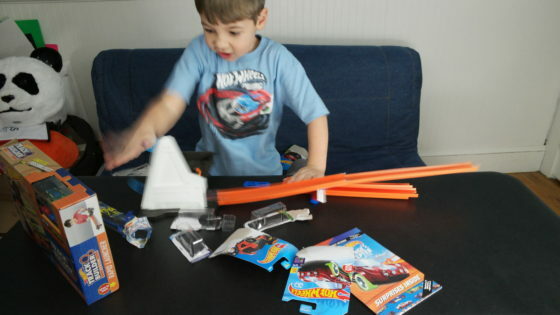 He had a great time playing with this bx and I hope it reignites his excitement of Hot Wheels. Check out the video below. I misspoke about the price of the monthly subscription. It is $24.95 a month (+ $5 Shipping) or $22.99 a month (+ $5 Shipping) for a 6 month subscription. You can sign up through our Hot Wheels Pleybox affiliate link.